Sag Harbor, NY - January 30, 2017 - Bay Street Theater & Sag Harbor Center for the Arts is pleased to announce two All New All Star Comedy Shows on Saturday, February 25 and Friday, March 24 at 8 pm. Tickets are $20 in advance, $25 at the door and available online at www.baystreet.org, or by calling the Bay Street Theater Box Office at 631-725-9500. The Box Office is open Tuesday through Saturday 11 am to 5 pm. All Star Comedy Shows feature the rising stars of comedy. 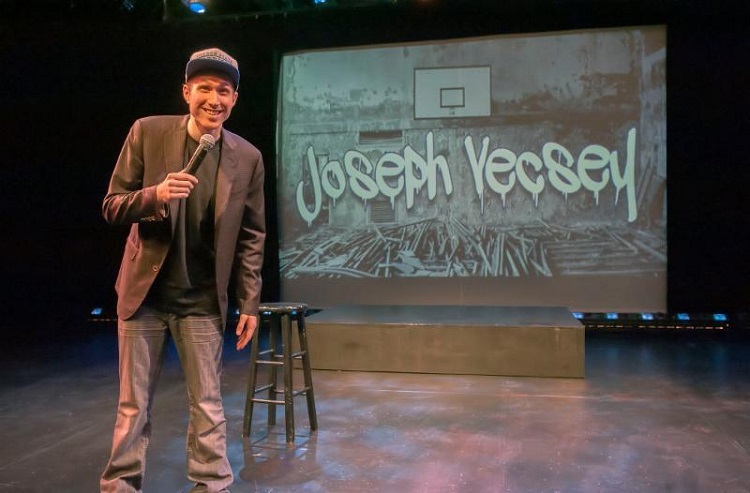 Joseph Vecsey hosts the February 25 show and is a featured comic in the March 24 show. Photo by Michael Heller. Hosted by Joseph Vecsey (Optimum Cable TV, The Call Back Podcast). Featuring Richie Redding (Tours with Katt Williams), Dave Sirus (Writer for Saturday Night Live, and Comedy Central Roasts), and Maurie Faustin (Oxygen and MTV). Hosted by Jamie Roberts (MTV). Featuring Joseph Vecsey (Optimum Cable TV's The Un-movers, Comedy Central's Comics to Watch), Anthony Devito (Comedy Central's Adam Devine's House Party, Jim Gaffigan Show), and Jay Nog (Gotham Comedy Live, Sirius XM). The All Star Comedy shows are sponsored in part by Forever Bungalows. Bay Street Theater & Sag Harbor Center for the Arts is a year-round, not-for-profit professional theater and community cultural center which endeavors to innovate, educate, and entertain a diverse community through the practice of the performing arts. We serve as a social and cultural gathering place, an educational resource, and a home for a community of artists.